First of all, to call it THE Belfast Cup makes it sound as if it were a richly embossed and engraved silver trophy, won for an important horse race. In fact, it is simply a hand-painted and gilded porcelain coffee cup, showing some signs of long use by its first owner who'd received it as a gift from her husband. 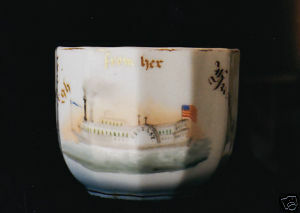 I purchased the cup on-line for a modest sum, eager to add it to my little collection of steamboat miscellanea, meaningful to no one but myself, and have since become involved in a little quest to know more about Hannah Thornburgh and the husband who brought her this souvenir from his journeys on the Mississippi River. As we can see from old steroview photos of steamboat interiors, such as that of the J. M. White, the owners of the boats spared no expense or extravagance in their efforts to provide luxurious accommodations for their passengers. The intricate interiors of the boats were often furnished by merchants for the owners as promotion for their own businesses, an arrangement that worked well for both parties: the boats had the best examples of the merchants' furniture, stained glass, china and silver, while the passengers knew where to find the latest items for their own homes in the Mississippi Valley. There are surviving examples of such advertising pitchers in museums, beautifully decorated porcelain, painted with colorful flowers and swirls of gilt -- as well as the name and address of the business. An artist named Rudolph Lux specialized in the painting and gilding of china. Among his work are "presentation sets" made specially for the owners including images of the boats, such as the "Dexter" and "Ruth." It is octagonal in shape, larger than the usual coffee cup, with about the same volume as today's mugs. So far, I haven't been able to find a man named Thornburgh associated with the "Belfast," except perhaps as a clerk, nor can I find to whom Hannah Thornburgh was married. But it is easy to imagine Mr. Thornburgh, seeing the presentation sets other men had made for their wives, going to a painter to have a similar item made for his wife. It is just as easy to imagine her pleasure in the gift, using the cup every morning that her husband was away, the heat of the liquid it held warming her hands. It is easy to imagine because I have done it myself, holding the cup filled with hot tea and taking myself back 150 years to a woman standing at her window, looking towards the river, wishing her husband well and wishing him safely home. 1983, Ohio University Press, Athens, Ohio. Jason T. Busch, Christopher Monkhouse, and Janet L. Whitmore, 2004, The Minneapolis Institute of the Arts.